Ollie and her toy bunny had been waiting a long time for the rain to stop. At last the day had arrived! Ollie in her bunny suit and yellow rain boots ventures outside, her buddy rabbit stowed in a basket. They have a date with some puddles just waiting to be splashed in! But before they reach the puddles, a spring wind whooshes past, bringing glittering silver blossoms past them. Suddenly, Bunny twitches his nose and everything is changed. Ollie thought she must be imagining it, but when she looked again, Bunny's ears were moving, too! Ollie watches in amazement as Bunny jumps out of his basket to join a group of rabbits at play and disappears through a big hole in the hillock and is gone. Ollie follows, emerging near a pond, where she spots Bunny crossing over some stepping stones. And there's a storm brewing ahead. The water was rising and Bunny was in danger! But then Ollie recalls that she still has her yellow umbrella along. Can she turn it upside down and use it as a rescue vessel? 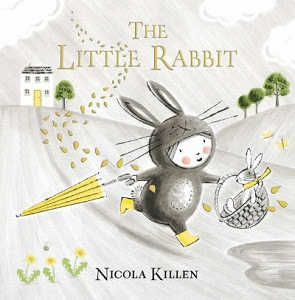 It's a bit of a down-the-rabbit-hole story, in Nicola Killen's latest in series The Little Rabbit (The Little Animal) (Simon and Schuster, 2019). Luckily for Ollie, there's an easier way home--right through the convenient die-cut openings in the page, where she and her toy bunny have a magical flight with her umbrella among golden petals on a favorable spring breeze. There's no place like home, and, like Dorothy in her return from Oz, Ollie soon finds herself snugly tucked into bed. Bunny seems to be back to being a cuddly toy ..., but she spots a tiny nose twitch that may mean more adventures ahead for Ollie and Bunny. Nicola Killen's sweet spring fantasy is illustrated primarily in grey line drawings, with accents of seasonal yellows and greens that direct the young reader's attention. Accents in glittering silver and gold presage the whimsy of this fantasy tale and die-cut openings in the pages ground the two adventurers and open the way to their happy return. Says Publishers Weekly, this just-published bunny tale offers "light enchantment [in] this quiet story of a rainy day adventure." Killen's companion book for the winter season is The Little Reindeer (The Little Animal) (see review here).